Burgera AC60 acoustic amp - anyone ever hear one?anyone ever hear one? Bugera AC60! Has anyone tried this thing? See attached pic. It looks almost identical to an AER in terms of design and features but I'm wondering if the similarities end there. The $250 price tag is very appealing though, and there's a used one in my neck of the woods for $150! I'm a very happy AER Alpha owner, but for that price I might swoop it up and A/B the two just to satisfy my curiosity. Just ordered one of these, should arrive Saturday 20th. Will let you know what it's like once it arrives. You also might be able to use it as an extension amp to your AER, I'm thinking it might be a good inexpensive solution. I couldn't resist and got one, too...receiving it tomorrow...we'll see how it sounds..
Great stuff, it'll be interesting to hear your view on it. Hi all. My Bugera AC60 arrived today and I've been pkaying with it for a couple of hours. I don't have an AER to compare it with so I can't do an a/b comparison. My usual amp is a Fishman Mini Loudbox which I use regularly with a singer. I've never been happy with my guitar sound through the Fishman but the mic channel on it is superb. I use an Audio Technica 731b through a Headway EDB 1 preamp. Using the same setup on the Bugera gave a really good sound to my ears using either the line out or the xlr out with a jack adapter. The only thing I thought strange was that on the guitar channel I had to turn the bass and mid to 0 and the treble all the way up. I tried the mic channel and, to be honest, I don't think it's as good as the mic channel on the Fishman but I'll test it out tomorrow with our singer. On the plus side the Bugera looks well made, the fx aren't bad if a bit fiddly to set up and it's much lighter than the Fishman. Given that it only cost 148 pounds I think any criticism pales into insignificance. The next step will be to try it with a piezo equipped guitar. 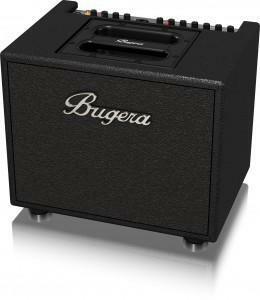 I used the Bugera yesterday and it worked really well so I'll be using this as my main amp. I was pleased with the overall sound and I have only started to scratch the surface with this. I read an online review at another site which said that the Bugara runs at really low (20%) power, making it a good candidate to use with a battery... have you tried that? I'm strictly a mains power guy. Veering a bit off topic, but since you brought it up, I've used my AER alpha as well as some 15 watt fender tube amps with a lithium ion camping battery (some $200 thing off Amazon) for gigs many times. At the volumes I play I have never had an issue with power. I've never run the battery down but my estimation is it would run 8 hours or so. Definitely has lasted me multiple gigs and I'm surprised more people don't do this. The battery is the size of a small lunchbox and only weighs a few pounds. Veering a bit off topic, but since you brought it up, I've used my AER alpha as well as some 15 watt fender tube amps with a lithium ion camping battery (some $200 thing off Amazon) for gigs many times.